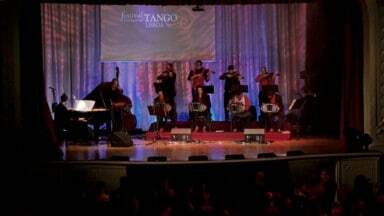 030tango has the great pleasure to work with some of the best Tango orchestras of the world. We specialize in recording their live performances to the highest video and sound standards to bring them home to you, as they played live. Watch some of our favourite live performances, with and without dancers. Silencio Tango Orchestra was founded 2001 in Europe. After just a few years, the group quickly gained a great reputation playing at tango festivals throughout Europe and is now one of the most famous tango orchestras founded on the European continent. Solo Tango Orquesta from Moscow it one of the top Tango Orchestras of today. No matter if at the concert hall or on the milonga, they play their repertoire with unmatched precision and energy. La Juan D'Arienzo Tango Orchestra took shape at the end of 2012 with the idea of keeping alive and performing the unmistakable style of the composer Juan D´Arienzo” through a new generation of musicians of wide range in the genre, inheritors of a personal mark of whom can be weighed as one of the most important musicians and arrangers: Carlos Lazzari. El Cachivache Quinteto is a young orchestra with a very unique style. Some call it Tango Punk. What can't be denied is, that they have a creative and modern take on Tango music that is connected to the roots of Tango at the same time. Dúo Ranas Leandro Schnaider and Pablo Schiaffino form Dúo Ranas. Although they are a smaller band than the typical Tango Orchestra they manage to heat up the dance floor and the concert hall alike. Quinteto Ángel Since its foundation in 2001, Quinteto Ángel has quickly advanced to one of the most prominent Tango groups of Germany. With extraordinary personal commitment and enthusiasm those five musicians indulge in a music which draws its intensity from unifying the seemingly opposing musical forces of static and heavily melancholic melodies, with an impetuously pulsating rythmic energy. Sexteto Milonguero The Sexteto Milonguero formed in 2007 with the simple desire to play the Tango dance repertoire, usually heard in the milongas, emphasizing the 40′s, and beyond the excellent versions heard for years, Sexteto Milonguero tries to give a personal sound to these great old songs..